Yesterday, we asked you, the Gizmodo readers, what problems you’re having with the iPhone 7 so far. We’ve received tons of emails so far, and we’re still taking submissions so email me. The most annoying issue to date appears to be problems with the new phone’s Bluetooth connectivity. 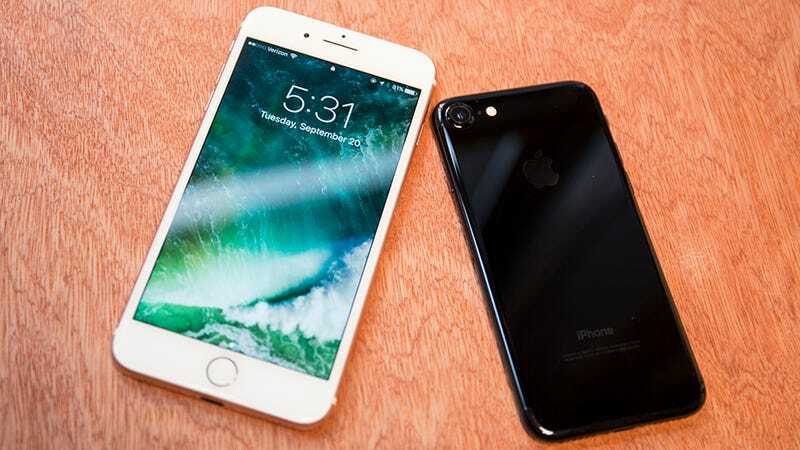 Some readers, like Sandy Williams, say that they can’t connect the new phone to the Bluetooth adapter that worked fine with an iPhone 6. A reader named James reports that his new iPhone 7 won’t connect to his car or speakers automatically, something his old iPhone 5 did without a problem. Another reader, who didn’t give their name, called the iPhone 7 “a nightmare” and said that Bluetooth keeps disconnecting. Music will stop playing on their device or through the speakers, even though it looks as if it is still playing. I ran the public beta on my 6S for about a month with no problems upgrading to the GM on the day iOS 10 went live. No problems. When I got my iPhone 7 however I’ve been plagued by Bluetooth audio problems. I use a pair of $20 Aukey Bluetooth headphones. They pair just fine but when I power them on subsequently I get the connected message (which is actually a Siri-like spoken message that comes from the headphones) but the audio is still routed to the speaker on the phone. The battery indicator for the Bluetooth device appears in the status bar and the Bluetooth settings say connected but the audio won’t route to the headphones until I go through a frustrating little dance of clicking disconnect then connect over and over in the Bluetooth settings to get the audio to play. Until then even the audio device picker in control center doesn’t show the headphones. Happens every time. I think this is just a software glitch. Maybe my headphones don’t 100% adhere to the BT spec, I don’t know. This glitch was common for me when using BT on iOS 7 but I hadn’t seen it for a while, certainly not in iOS 9. It used to automatically switch to BT audio automatically as soon as the headphones were powered on. In terms of more specific Bluetooth screw-ups, many BMW owners are reporting that the iPhone 7 and iPhone 7 Plus are having major problems connecting to the in-dash audio system via Bluetooth. Bluetooth connection in my BMW doesn’t always work. It connects then stops working then I have to disconnect and reconnect again. Sometimes it works and sometimes it doesn’t. In fact, many of the Bluetooth issues we’re getting feedback on are related to car systems. The issues appear on regular in-car entertainment systems as well as on those with Apple’s CarPlay installed. I love my new iPhone 7 Plus for the most part. The biggest annoyance I’ve encountered is that CarPlay no longer works. This is a huge bummer for me, as I used to use CarPlay every day during my commute to work. I’ve tried everything I can think of (and everything folks online can think of), to no avail; the phone either fails to connect altogether or fails to stay connected longer than 30 seconds or so. Gary Tate has a 2016 Honda Civic and reports that his CarPlay experience has been hit or miss. Tate says that Honda advised him to disable Bluetooth on the iPhone and to connect to the head unit via USB. He says that while this works better, it’s still buggy, and and that the head unit on his car reboots on occasion. Honda told Gary that the problem here stems from the fact that the head unit software was written for iOS 9. Anyway, the 7 Pluses will begin to seemingly “skip ahead” while streaming anything over Bluetooth, whether it be local media, streaming media, maps, Siri, or anything else. This occurs only on the 7 Pluses which I own, and not a 6S Plus - even when they are side by side, indicating that there is a problem specifically with that particular model. I tested five phones in total, and confirmed that three of my own 7 Pluses had same issue in four vehicles where the 6S Pluses functioned without a problem. Originally Apple tried to troubleshoot this as a connection issue and mentioned that 7/7 Pluses have degraded signal strength over its predecessors. After assuring them that it wasn’t just streaming audio, they continued to troubleshoot and eventually escalated to the engineers. I worked with them to install a service profile on my device to help troubleshoot, as well as logged 24 different times within an hour of playback where the problem occurred. Rob also included video of the skip problem, which you can see at the 00:07 mark. Gizmodo readers aren’t alone in having problems. On Thursday, 9to5Mac ran a poll asking about Bluetooth connectivity issues with the iPhone 7 and on iOS 10. So far, 23 percent of respondents have said that they are having issues with Bluetooth on their iPhone 7. Given what we know, our best guess as that the connectivity issues are a software problem that could be fixed with updates. Let’s hope so, because if the Bluetooth hardware on the iPhone 7 is borked, it’ll be a problem for years to come. We’ve reached out to Apple for comment on Bluetooth connectivity issues and will update if we hear back. If you’re having Bluetooth issues, or any other problems with your iPhone 7, let us know in the comments or message us at christina.warren@gizmodo.com.